Brazil Begins To Evict Settlers From Awá Land; Will It Be Enough? In a big breakthrough for indigenous groups in Brazil, government troops have begun to evict illegal settlers from indigenous lands in the eastern Amazon. The Awá—which some consider “the most threatened tribe on earth”—have seen their population reduced to about just 450 due to incursions by loggers, farmers, and ranchers. Starting this week, non-indigenous residents will be given 40 days' notice to leave, with help provided for their resettlement. Stephen Corry, director of Survival International, which has launched a campaign to save the community, said the operation was a victory for the global campaign to save the tribe. "This is a momentous and potentially lifesaving occasion for the Awá. Their many thousands of supporters worldwide can be proud of the change they have helped the tribe bring about. But all eyes are now on Brazil to ensure it completes the operation before the World Cup kicks off in June, and protects Awá land once and for all," he said. Action to evict the invasores has been slow, and conflicts – including sporadic killings and arson attacks – have occurred. A Vanity Fair reporter who recently visited the area estimated that illegal logging roads were now only a few miles from an area where the last 100 uncontacted Awá hunt. As an action against illegal loggers, the environmental impact of Brazil’s move is surely to be positive. But observers around the world concerned about preserving forests and mitigating climate change should be even more fundamentally concerned with the survival and thriving of the Awá. As Survival International points out, the areas in which Brazilian rainforest has been best preserved are the same areas in which tribal peoples have managed to hold on. The Awá are effective stewards of the forest due to their deep respect for it: “To them, the forest is perfection: they cannot dream of it being developed or improved upon,” according to Survival International. 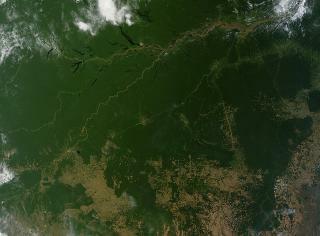 Time will tell if the Awá, and their forests, get adequate protection from the Brazilian state.